The Petite Advantage Diet was created by Jim Karas, author of the number one New York Times bestseller “The Business Plan for the Body”. It is a weight loss program designed specifically to suit the needs of petite women, 5’4” and under. Karas has been helping petite women to achieve their goals for over twenty years. His diet and fitness techniques, tailored uniquely for petites, help them to get fast results as they become longer, leaner and more confident. The foundation of The Petite Advantage Diet involves a twenty-one day eating plan involving cycling of calories. For three days you will consume 1100 calories, followed by one day on 1600 calories. This helps to keep your metabolism high and prevents muscle loss that can occur on continuous low-calorie diets. Karas asserts that it is essential for petites to eat their biggest meal of the day at breakfast. This actually makes it easier for you to control your calorie intake for the rest of the day because it reduces your appetite. On the 1100 calorie days you should consume 400 calories at breakfast, 300 at lunch and 300 at dinner. Your caloric ratio will consist of 40 percent carbohydrates, 35 percent protein and 25 percent fat. The relatively high intake of protein has the effect of boosting your metabolism as well as promoting a feeling of fullness after meals. The meal plan highlights a variety of foods including lean protein, low-fat dairy products, whole grains, legumes, nuts, vegetables and fruit. For the most part it is best to prepare your own meals but the book also includes an entire chapter on eating out, where you are provided with precise guidelines that will help you order meals that fit within your allotted calorie allowance, for both the 1100 and 1600 calorie days. Chicken breast, turkey, lean beef, mahimahi, tuna, salmon, tofu, eggs, cottage cheese, skim milk, whey protein, low-fat Greek yogurt, hummus, black beans, almond butter, sweet potato, spinach, tomato, cucumber, broccoli, onion, lettuce, apples, blueberries, avocado, brown rice, Ezekial bread, olive oil, tea. 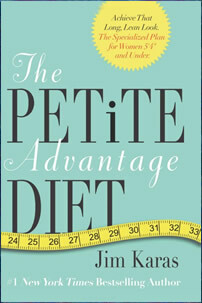 Jim Karas says his fitness program included in The Petite Advantage Diet is going to make you “lighter and tighter”. You will not just lose weight but will undergo body recomposition, resulting in an increase of lean muscle and a reduction of body fat. He asserts that cardiovascular exercise can have damaging effects so he doesn’t endorse it. Any more than thirty minutes reduces immunity and it can also increase your appetite and cause harm to the joints. Instead he recommends a full-body strength-training interval program using “gravity straps”, which work by harnessing your own body weight, providing you with all the resistance you need. Included are descriptions and photographs of the exercises. The program takes about thirty minutes to complete. The Petite Advantage Diet: Achieve That Long, Lean Look. The Specialized Plan for Women 5’4″ and Under retails at $25.99. Gravity Straps sell for $39.99. Designed to suit the unique needs of petite women. Includes a 21-day meal plan with recipes and shopping lists. Based on calorie cycling, which helps prevent the metabolic slowdown that can occur with long-term continual dieting. High intake of protein reduces appetite and prevents loss of lean muscle. Provides advice on how to eat out and stick with the plan. An exercise program is included. Does not apply to women over 5’4” or men. Requires monitoring your calorie intake. Will not appeal to dieters who prefer not to follow structured plans. Does not contain a maintenance plan. The Petite Advantage Diet is a weight loss plan designed to address the unique needs of petite women 5’4” and under. The specific advice contained in this book regarding diet and exercise should help petite women to get results that may be difficult to achieve on standard programs. Karas, J. (2011). The Petite Advantage Diet: Achieve that Long, Lean Look, the Specialized Plan for Women 5’4″ and Under. HarperOne.